Representatives of the company "Guinness World Records" recorded new attractions in Ashgabat as the largest in terms of the parameters of certain structures. This was certified by the certificates according to which the image of the horse decorating the podium of the Olympic stadium in the capital is recognized as the largest architectural symbol of the horse on the planet, and the Olympic Swimming Center is the world's largest indoor swimming pool, using the latest technologies and environmentally friendly materials that meet high international standards. According to measurements made on March 6, 2017 to fix the parameters before entering the Guinness Book of Records, the height of the monumental image of the horse is 40.05 meters (131 feet 4.9 inches), length - 37.69 meters (123 feet 7.9 inches) and the width is 40.24 meters (132 feet 0, 6 inches). Together with the horse, the bowl for the fire of the Asian Games raises, which, on the initiative of the President of Turkmenistan, was framed in the form of a bundle of the healing herb yuzerlik - a traditional amulet of Turkmen. Functions of the amulet such as protection, performs the lace-amulet aladja, decorating the bowl for fire and the neck of a horse. 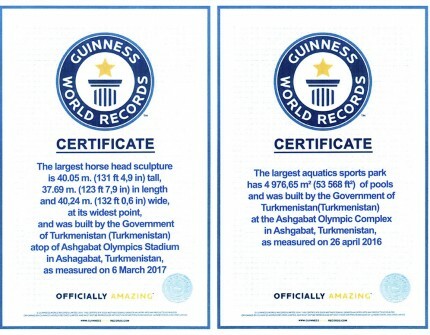 The second certificate was awarded to the Water Sports Center of the Ashkhabad Olympic Town, which was included in the Guinness Book of Records as the world's largest aquatics sports park. In this water complex, 5,000 spectators can watch simultaneously the competitions in swimming and diving. In its walls there are four swimming pools of different size. According to the Guinness Book of Records made on April 26, 2017, the total area of ​​the pools of the complex is 4 thousand 976.65 square meters (53,568 square feet). The new water complex includes a sports therapy site, sports and fitness hall, comfortable locker rooms and a recreation room for athletes, a first aid station. On this occasion on August 21, 2017 a solemn meeting with the participation of the members of the government of Turkmenistan, heads of several ministries and departments, media, cultural figures, representatives of public organizations of the country, faculty and students of the capital's universities took place at the office of the Executive Committee for the preparation for the 5th Asian Indoor and Martial Arts Games. The closer the V Asian Games, the more active attention is paid by the President of Turkmenistan to the readiness of the capital and the Olympic town for this major event, personally inspecting its facilities. And this again underscores the high status of the event, with the success of which our country will join a number of world's sports powers, and in time will be able to claim the holding of the Olympic Games.